The “Skeleton Marker” Version Ships With Velocity 3.0! Velocity is the brainchild of Scott Alexander. It's his adaptation of the classic "Signed Bullet Catch". Scott has been performing various versions of his routine since 1989. Over the years, Velocity has gone through many incarnations and upgrades. Velocity 3.0 is version that is great for family shows as the paintball marker is what we call the "Skeleton" version. It has the shape of a gun but it's obviously a paintball gun. All great effects have an emotional hook. It's the hook that makes the audience watch. The hook for Velocity 3.0 is danger, apparent real danger that the performer could be hurt. Velocity 3.0 is incredibly convincing. To the audience, the danger is imminent and real. The truth is there is absolutely no danger to the performer at all. Safety is our #1 concern. Velocity 3.0 is cleverly designed to do the dirty work for you and eliminate any possibly of injury. 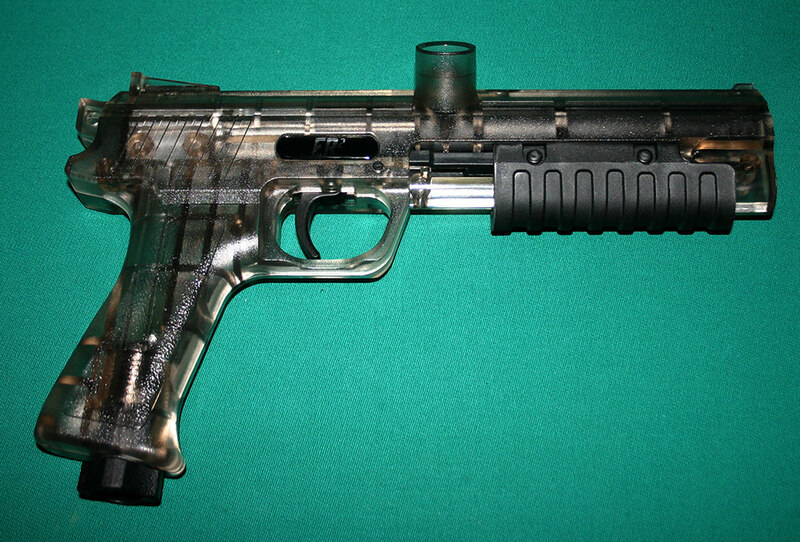 Past incarnations of Velocity have used paintball markers that did not look like a gun. They were introduced to the audience as a paintball marker. That has all changed. Velocity 3.0 has a new weapon that actually is a paintball marker but it finally has the shape of a real gun. It's modeled after a World War ll .45 caliber pistol. The Skeleton version on stage shows up much better than any of the previous versions. Previously all of the markers were black. The Skeleton close up looks transparent but under lighting it shines with a silver look that is much more visible on stage. This new pistol is better in virtually every respect. 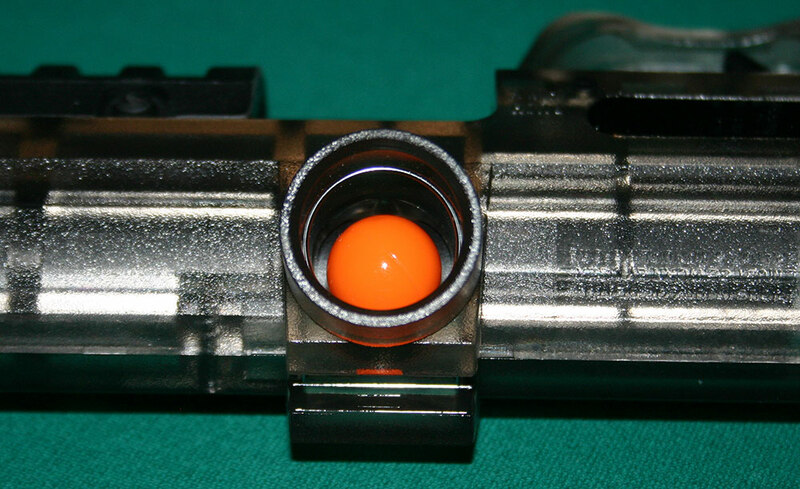 First, the CO2 cartridge is housed in the handle. There is no funny looking adapter. The air seals are amazing. A cartridge will last for multiple shows now. Mechanically, the new gun is superior in every way. It's a completely new design. 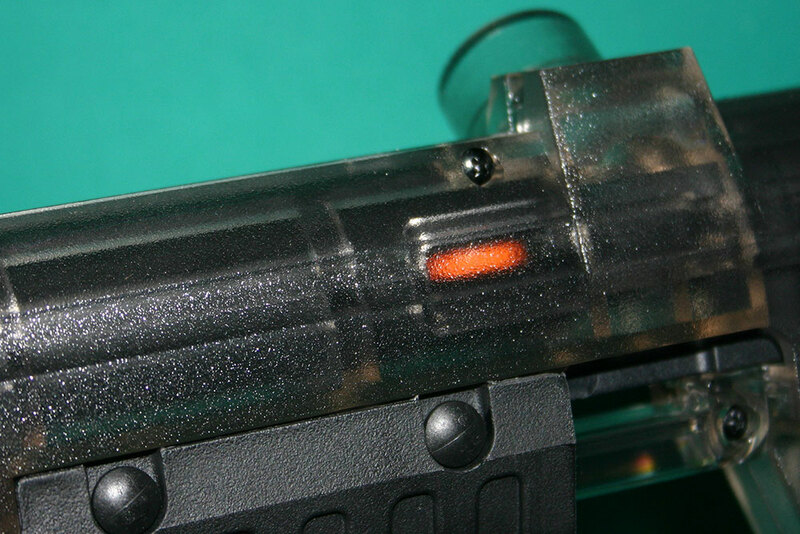 The loading of the ammo is improved and covers the actual method. The cocking and firing mechanism is rock solid ensuring many years of use. Until now, Velocity has always been performed with paintballs as the ammunition. Paintballs explode and provide a great visual. Velocity 3.0 creates danger and suspense through proofs. This is the process of proving that the gun is real, it really fires the ammo and now with Velocity 3.0 the new proof really sells DANGER. The audience is totally convinced by our new proof that if something goes terribly wrong, the performer will suffer the consequences and be injured. Nothing could be further from the truth, Velocity 3.0 is totally safe but the audience will be on the edge of their seats! It really doesn't get any easier than this. Velocity 3.0 provides the performer with the best equipment that does the work for you. Once you master the simple handling and choreography. performance is mindless. You can concentrate on your performance not technique. Scott teaches the best way to handle each phase. It's simple and very easy to do. Velocity 3.0 is so much easier to transport than our previous versions. Everything you need for multiple performances is contained in just one small case. Velocity 3.0 is less than half the size and weight of Velocity 2.0. The Velocity 3.0 video training is delivered by instant download when you place your order. You will have the training instantly so you can start the learning process while you wait for the Velocity 3.0 hardware to arrive. The video is delivered in HD 720P. The training is 52 minutes in length. There is a performance shot live inside a cruise ship theater. The Inner Secrets of Velocity 3.0 are covered in incredible detail you've come to expect from Bob Kohler Magic. For protection of your investment the video is embedded with each owner's identity. After purchase you will received an email from Bob Kohler Productions with the link to your video download. We will respond ASAP but please be advised that sales on the internet are instantaneous. It is possible we will advise you Velocity 3.0 are in stock but in fact our stock is sold out before your purchase. We are not responsible for any backorder situation.